I made this anniversary card for my hubby a few months ago. I found it when I was cleaning so I decided to post a little tutorial because I thought it was cute. Its a great way to use up scraps! Fold the white card stock in half along the 11″ side. This will create a large card that is 5.5″ x 8″. Cut your patterned paper to 5.25″ x 7.75″. (I actually just cut two strips and “hid” the cut sides under the black because I didn’t have much of the striped paper.) Adhere this to the white cardstock, centering it to leave a white border. Cut your black scrap with a wavy paper cutter (or tear it) to be 3″ x 7.75″. Adhere this to the patterned paper, centering it. 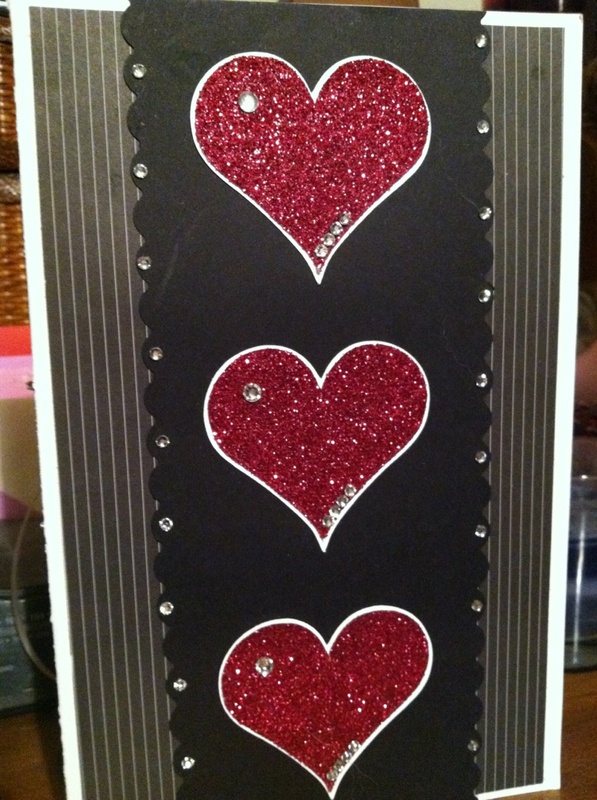 Using the die-cut machine, cut three larger hearts from the white scrap, and three smaller hearts from the glitter paper. Adhere the glitter paper to the white paper, matting the glitter heart. Adhere these to the front of your card, centered on the black paper. Adhere gems to every other “wave” on the black paper, in the left hand swoop of each heart and three to the bottom right of each heart. Stamp your sentiment inside and you are done! Hello there I followed you on pinterest. and i repinned some of the beautiful cards you have because am also into making cards. but i think I have less ideas..
and this one I’ll make one of these for my friend who’s getting married soon.. cheers!